For all operation precautions, see “Audio operation precautions” in this section. is off to call up the mode that was playing immediately before the system was turned off. To turn the system off, press the VOL (volume) knob / (power) button. (power) button to adjust the volume. Bass Adjusts the bass to the desired level. Treble Adjusts the treble to the desired level. Balance Adjusts the balance to the desired level. Balance adjusts the sound level between the left and right speakers. Fade Adjusts the fade to the desired level. Fade adjusts the sound level between the front and rear speakers. Speed Sensitive Vol. Adjusts the speed sensitive volume function, which increases the volume of the audio system as the speed of the vehicle increases. Set to “OFF” to disable the feature. The higher the setting, the more the volume increases in relation to vehicle speed. AUX IN Vol. Choose a setting from 0 to +3 to control the boost of incoming auxilary device volume. A setting of 0 provides no additional boost in volume. A setting of +3 provides the greatest boost in volume. to the desired level (-5 to +5). Once you have adjusted the sound quality to the desired level, press the MENU button repeatedly until the radio or CD display reappears. Otherwise, the radio or CD display will automatically reappear after about 10 seconds. For MP3 CDs: Running Time → Folder Title: → Album Title: → Artist Name: → Song Title: If the text information is too long to fully be displayed on the screen; press and hold the DISP button for longer than 1.5 seconds to scroll through the rest of the text. Press the DISP (display) button while the radio is playing to toggle the audio display between station number and RDS. To turn the clock display on or off, press the MENU button repeatedly until “Clock” appears on the display. Turn the TUNE/FOLDER knob to toggle the setting (ON or OFF). Press the MENU button repeatedly until “Adjust Clock” appears on the display. “Change Hour” will appear on the screen. Turn the TUNE/FOLDER knob to adjust the hours and then press ENTER. “Change Minute” will appear on the screen. Turn the TUNE/FOLDER knob to adjust the minutes and then press ENTER. The display will return to the regular clock display after 10 seconds if no further adjustment is performed. Press the AM button to change the band to AM. If another audio source is playing when the AM button is pressed, the audio source playing will automatically be turned off and the last radio station played will begin playing. If another audio source is playing when the FM button is pressed, the audio source playing will automatically be turned off and the last radio station played will begin playing. The FM stereo indicator (ST) illuminates during FM stereo reception. When the stereo broadcast signal is weak, the radio automatically changes from stereo to monaural reception. from low to high frequencies and stop at the next broadcasting station. high to low frequencies and stop at the next broadcasting station. Press and hold either button to seek at a faster speed. Press the SCAN button. SCAN illuminates in the display window. Scan tuning begins from low to high frequencies. Scan tuning stops for 5 seconds at each broadcasting station that has sufficient signal strength. When scanning, SCAN blinks in the display. Pressing the SCAN button again during this 5 second period stops scan tuning and the radio remains tuned to that station. Twelve stations can be set for the FM band (6 for FM1, 6 for FM2) and six stations can be set for the AM band. Choose the radio band AM, FM1 or FM2 using the AM or FM button. Tune to the desired station using manual, SEEK or SCAN tuning. 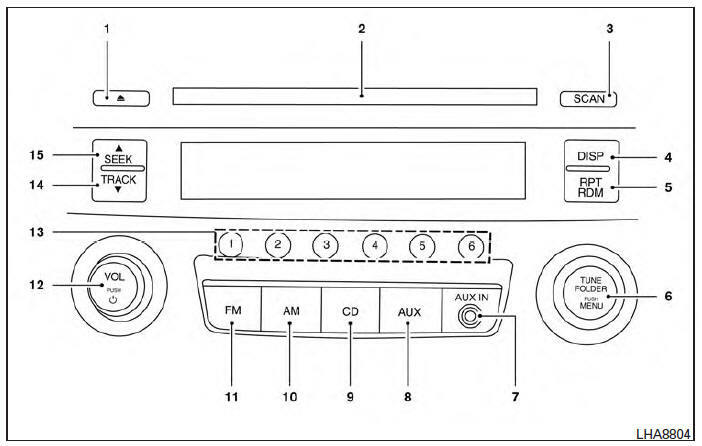 Press and hold any of the desired station memory buttons (1 – 6) until a beep sound is heard. The channel indicator will then come on and the sound will resume. Programming is now complete. Other buttons can be set in the same manner. 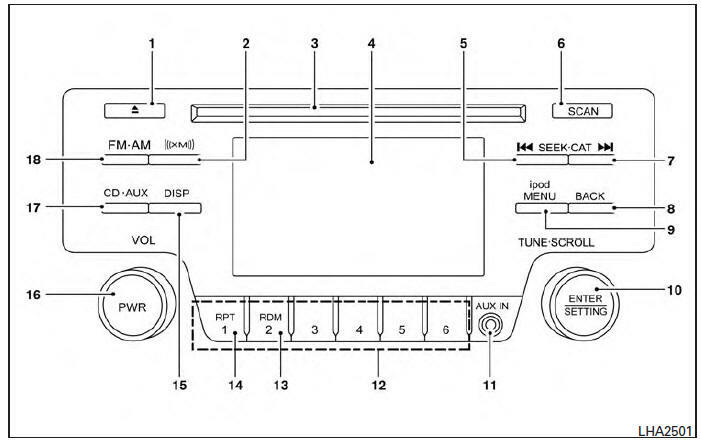 If the battery cable is disconnected or if the fuse opens, the radio memory will be canceled. In that case, reset the desired stations. Place the ignition switch in the ACC or ON position, and carefully insert the compact disc into the slot with the label side up. The compact disc is automatically pulled into the slot and starts to play. If the radio is already operating, it automatically turns off and the compact disc begins to play. When the CD button is pressed with a compact disc loaded and the radio playing, the radio turns off and the last used compact disc starts to play. button is pressed while the compact disc is playing, the compact disc plays at an increased speed while fast forwarding or rewinding. When the button is released, the compact disc returns to normal play speed. while the compact disc is playing, the next track following the present one starts to play from the beginning. times to skip several tracks. Each time the button is pressed, the CD advances one additional track. The track number appears in the display window. pressed, the track being played returns to the beginning. several times to skip back several tracks. Each time the button is pressed the CD moves back one track. TRACK REPEAT: The track that is currently playing will be repeated. DISC RANDOM: The order of the tracks on the disc will be mixed during play. DISC REPEAT: The disc currently playing will be repeated. FOLDER REPEAT: The tracks in the current folder will be repeated. FOLDER RANDOM: The order of the tracks in the folder will be mixed during play. Press the SCAN button for less than 1.5 seconds to scan all tracks of the current disc for 10 seconds per track. The SCAN icon is flashed during scan mode. The scan mode is canceled once it scans through all tracks on the disc, or if the SCAN button is pressed during scan mode. compact disc loaded, the compact disc will be ejected. compact disc is playing, the compact disc will eject and the system will turn off. The AUX IN jack is located on the CD player. The AUX IN audio input jack accepts any standard analog audio input such as from a portable cassette tape/CD player, MP3 player or laptop computers. Press the AUX button to play a compatible device when it is plugged into the AUX IN jack. Press the MENU button repeatedly until “AUX IN Volume” appears on the screen to control the incoming volume level of the auxiliary input device. Turn the TUNE/FOLDER knob to adjust the level between 0 and +3. *No satellite radio reception is available when the XM button is pressed to access satellite radio stations unless optional satellite receiver and antenna are installed and an SiriusXM® Satellite Radio service subscription is active. Satellite radio is not available in Alaska, Hawaii and Guam.